Each season, a theme or two emerges. Two seasons ago, it was cousins and islands. Last season, it was fjords and drones. This year, it seems two themes are again emerging. The first we shan’t speak of after this. It’s the darned wind and current – always against us! I’m beginning to wonder if the Baja Bash wasn’t the way to get to the Pacific Northwest after all!! But the second, oh what a theme! The Tall Ships!! 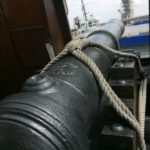 We last encountered a Tall Ships race in Scotland in 2011. There, though, it seems wherever we went, they had just been there or were coming next week. We finally got within AIS range of one, but the fog literally enshrouded her and we never saw her. Quite elusive. 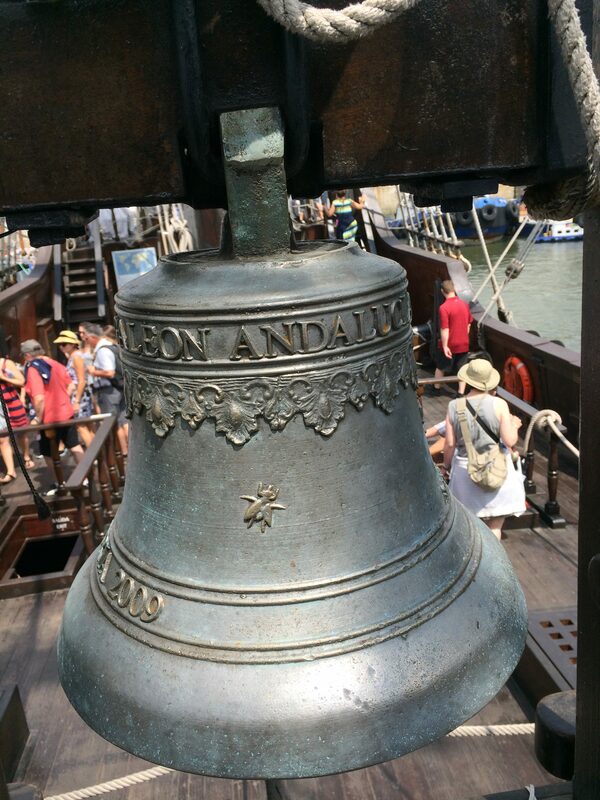 This time, however, we have become Tall Ship groupies. Wherever they go, there we are. 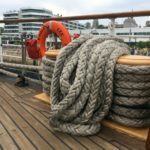 As we weighed anchor in Charlottetown harbor on June 30th to begin our voyage around Gaspe, nine Tall Ships were forming just outside the harbor to make a grand entrance. 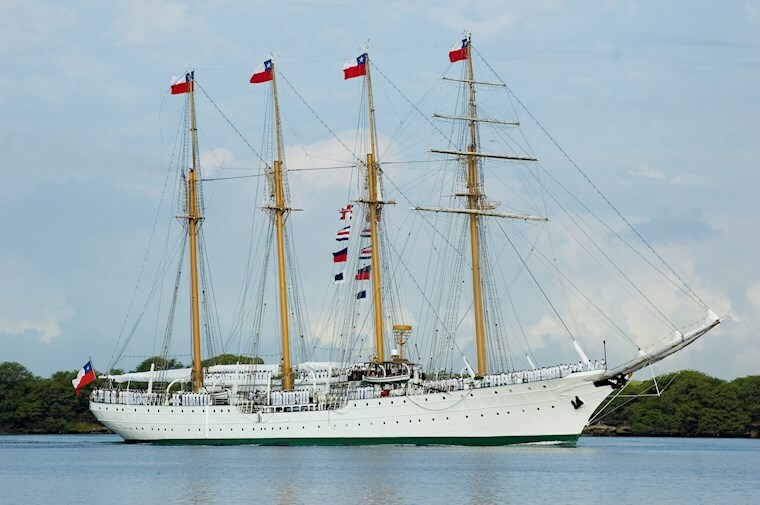 We gawked as they paraded by, many under full sail, giving an especially robust greeting to the Eagle, the U.S. Coast Guard training tall ship. 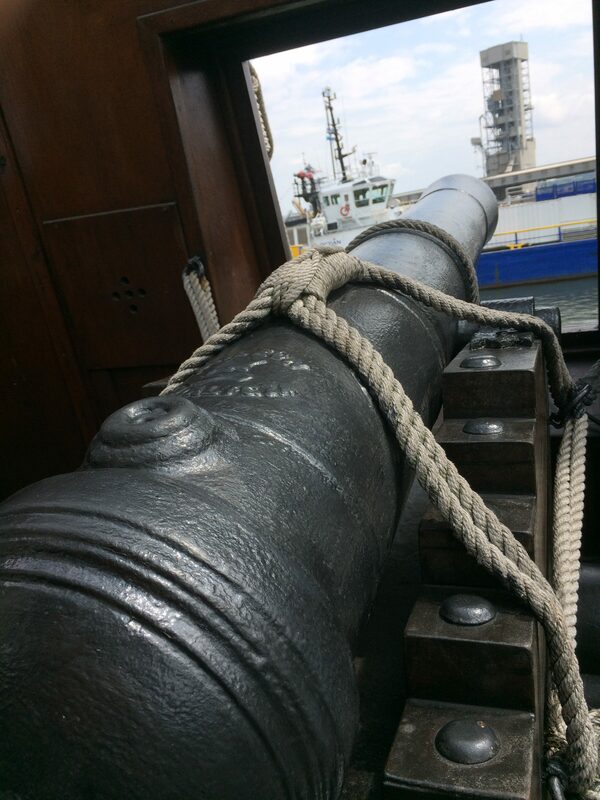 Many cadets were climbing high up in the rigging as she sailed by. Castle from the Cook Islands, the German Tall Ship Alexander von Humboldt, and the Bowdoin from Maine Maritime Academy, were all welcoming visitors on board. Next day, the winds subsided and we put out to sea for an overnight passage to Gaspe. 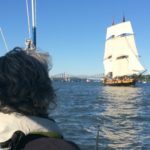 For a while, all three Tall Ships seemed to shadow us as we rounded the southwest corner of the island and left the Northumberland Strait. But overnight, we lost them as they scattered to their next destination. itinerary established for it by the race organizers. 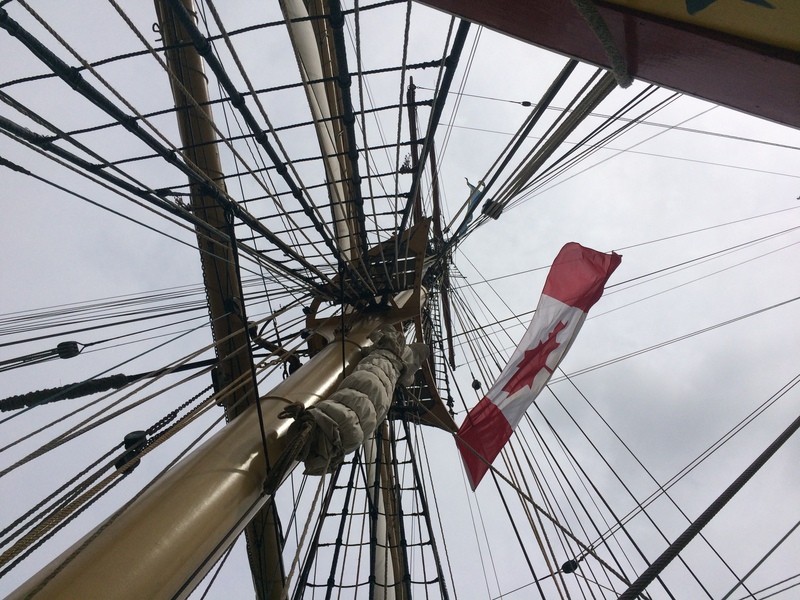 Many Canadian ports, from Toronto to Corner Brook, Newfoundland, to Halifax, will receive a Tall Ship visit and the celebrations that go along with it. 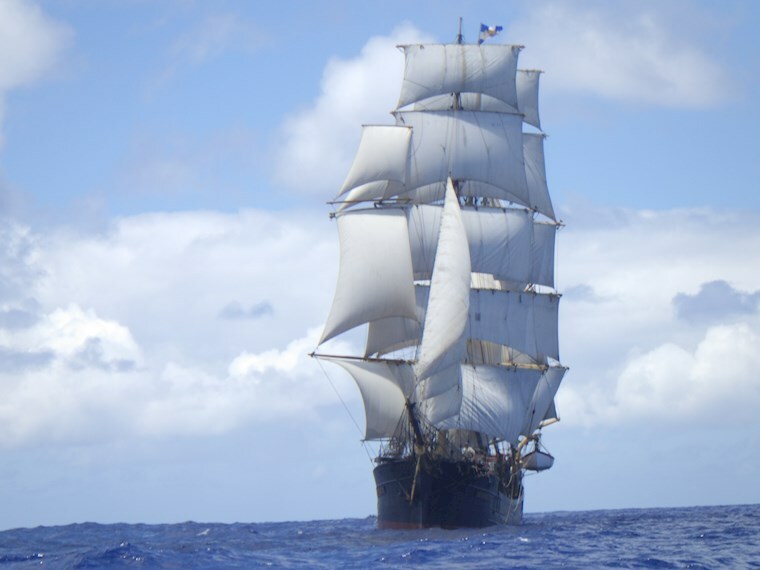 But there is only one place where the Tall Ships will all be in the same port at once – Quebec City, July 18th to 23rd. Guess where we were headed? 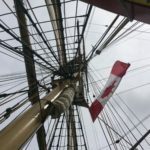 We encountered a Tall Ship or two on our way to Quebec City, one in Gaspe, one in Riviere du Renard, three in Baie Eternite, but nothing prepared us for the grandeur of Quebec. 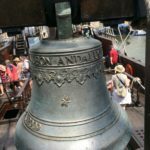 We arrived in Quebec City on July 16th and backed into a slip at the Marina Port de Quebec, right next to Old Quebec. Several Tall Ships were already in port, just a few slips down from us. One by one, the remainder of the 38 arrived to take their place among the harbor wharves and docks. 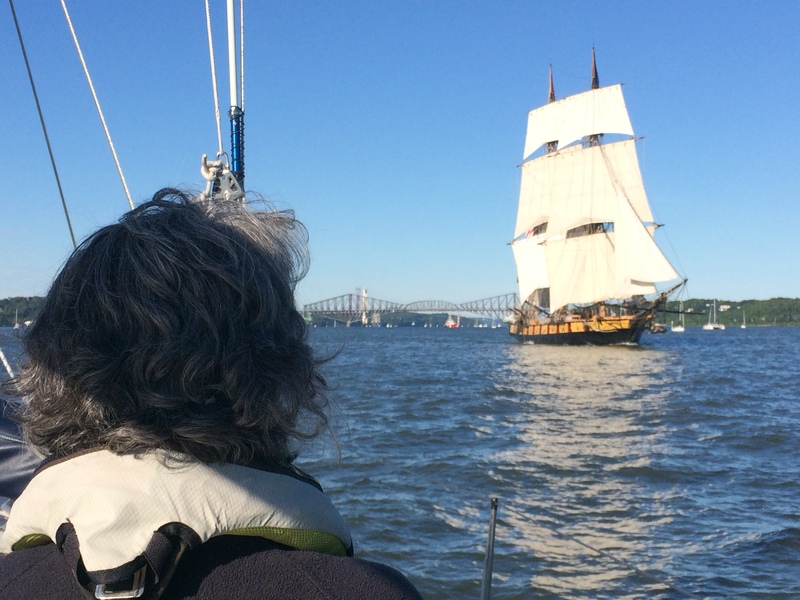 We sailed past several of the last arrivals on the 18th as we moved the boat from the Port de Quebec Marina to a mooring ball at the mouth of the Chaudiere River a few miles upstream. Finally, they were all assembled. board and seeing them up close. 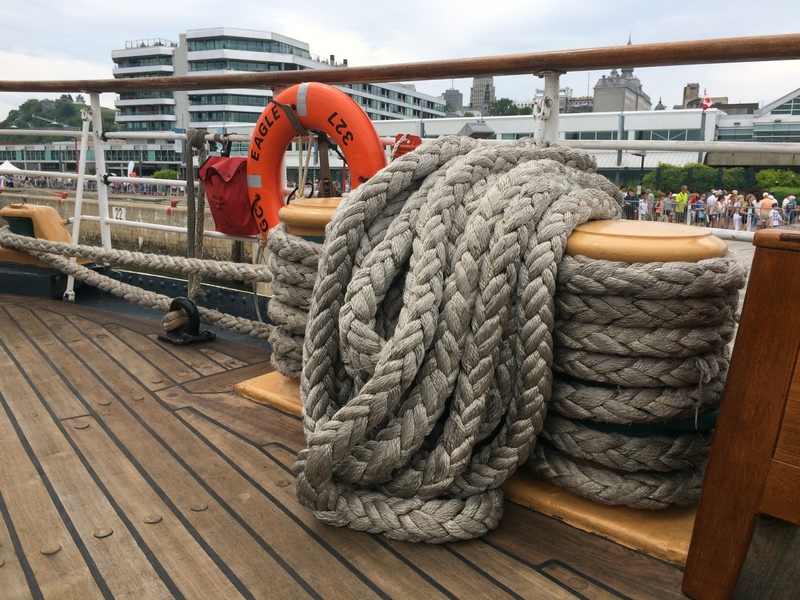 We marveled at the size of the dock lines on the Eagle, the detail of the figurehead carved into Europa’s bow, the complexity of the rigging aloft on the Bluenose II. 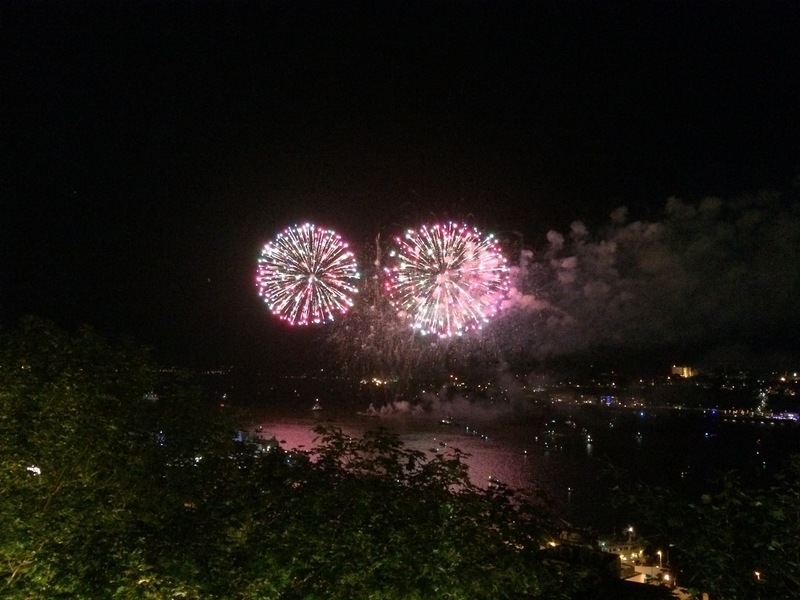 Jesse departed and Jocelyn arrived, just in time to witness the grand finale…a huge fireworks display over the St. Lawrence! The next morning dawned bright and brilliant. We rose early and let go of the mooring line. All 38 ships were forming up to parade past Old Quebec in full sail. We motored out among them, holding steady in the strong current asthey proceeded by us. As we waved goodbye, they receded into the distance, a Quebec City tugboat sweeping them along, water cannons shooting port and starboard.